I am probably the last person on Earth to discover Meyer lemons. While browsing the produce isle at the local supermarket I noticed these lemons on sale. Originally priced at twice as much as regular lemons, they were now reduced to quite a reasonable price. I had no plans to purchase lemons, and was not even in the mood for something lemon-y, but curiosity got the best of me. Why were they so expensive? Was it worth it? Why were they packaged in a cute bag like something special? I had to check. Meyer lemons turned out to have thin, tender skin, orange color and a fragrant, but not harsh or overly lemon-y, smell. They were also more juicy and less tart than regular lemons. But still not sweet enough to just eat fresh, on their own. After a little research I found out that Meyer lemons are common in California and are believed to be a cross between lemon and mandarin orange. Because I'd never dealt with Meyer lemons before I decided not to risk it and just use the recipe on the package. It was for lemon pudding cake. 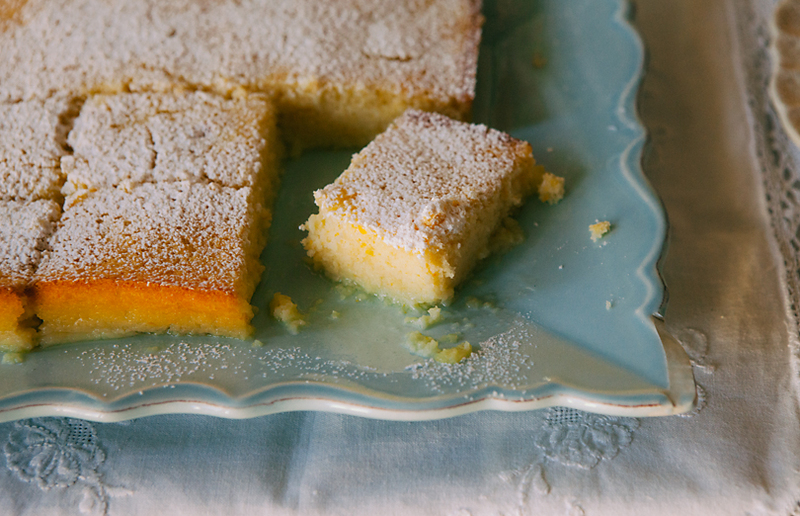 The same recipe has been making rounds online, and for good reason: the cake came out spongy on top and had a pudding-like bottom. 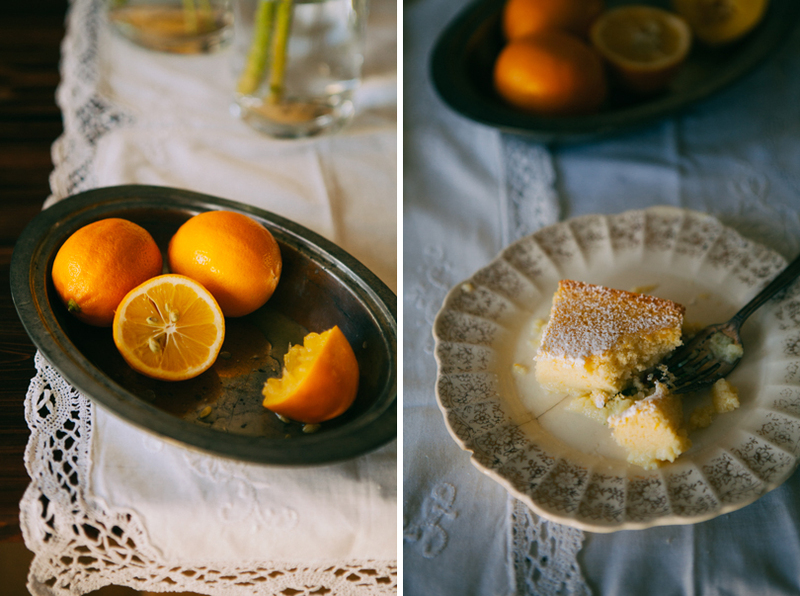 The unusual combination, together with the lovely delicate citrus-y flavor made the cake disappear before the sun went down over the horizon that night :). Preheat oven to 350F (180C). Butter or spray square 8 inch pan. Combine sugar, flour and salt. In a separate bowl, hisk together egg yolks, butter and zest. Gradually whisk in Meyer lemon juice. Alternating between flour mixture and milk, add them to yolks 1/3 at a time. Whip egg whites to stiff peaks, carefully fold them into batter. Pour the batter into pan, bake about 40 min. Let cool slightly, dust with powdered sugar and serve warm. Room temperature is ok too, if it survives that long. After all, it is a very small cake. I'm reading reports from other parts of the world, especially from my friends in Russia, about being buried under piles of snow in March and thinking about how lucky I am to live in Texas. Hot summers do not bother me one bit. We could do with less humidity, but I'll take that over cold winters any day. This week is the warmest yet, with temperatures hovering around 80F, even reaching 84F yesterday - a preview of what's to come later in the spring. And. I. Love. It. Some people are already braving the waters of the Gulf in their bikinis, but I will limit myself to burying my toes in the sand for the time being. On hot March days the pool is tantalizingly inviting but the water is still too cold to swim. 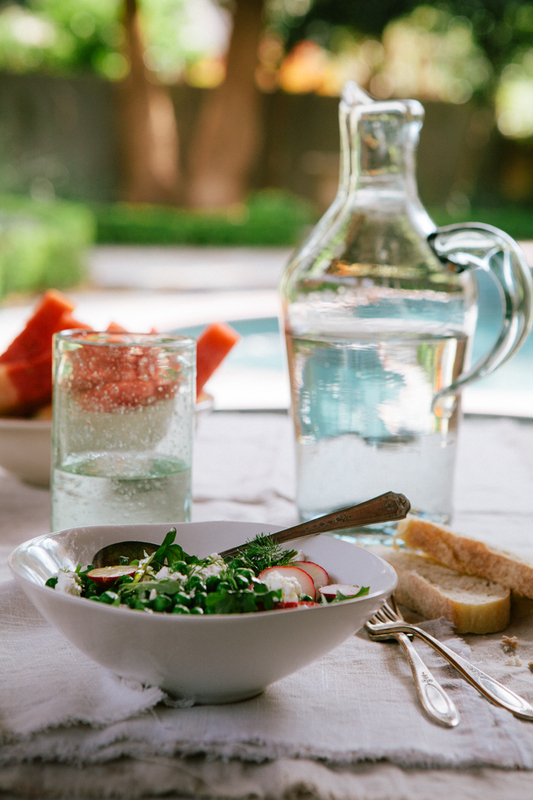 What we CAN do though is enjoy spending time on the back patio - reading, eating, listening to music. Grilling, of course. And the watermelons are finally here, nice and sweet. 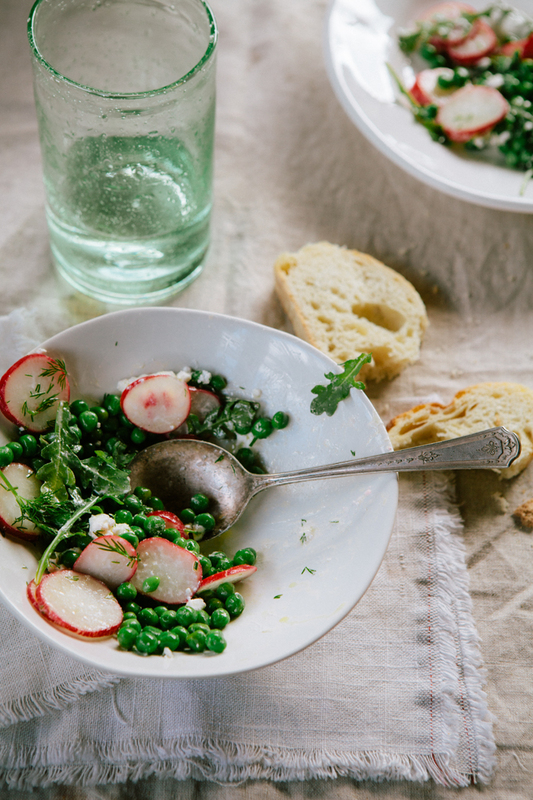 One perfect accompaniment to grilled meat or fish and a perfect spring dish is this green pea salad with radishes and feta cheese. It features Russia's favorite herb - dill. The combination of the dill, radishes and the tartness of feta makes me think of okroshka, definitely the favorite spring soup and always the sign of warmer weather. Radishes are usually among the first local produce to appear in Russia after the long winter. Of course, being a "naturalized Texan," I added a little local flavor by using lime juice in the simple vinaigrette. 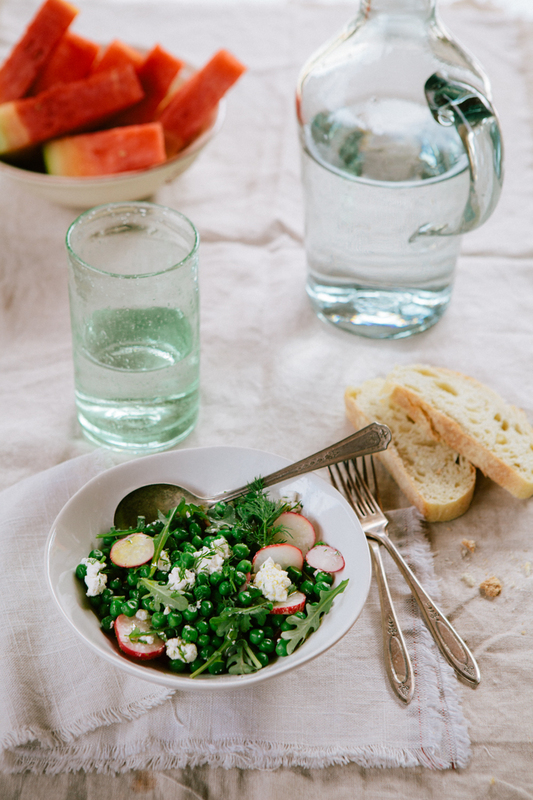 Carefully toss together peas, radishes, arugula, dill and feta. Whisk lime juice, olive oil, salt and pepper to emulsion. 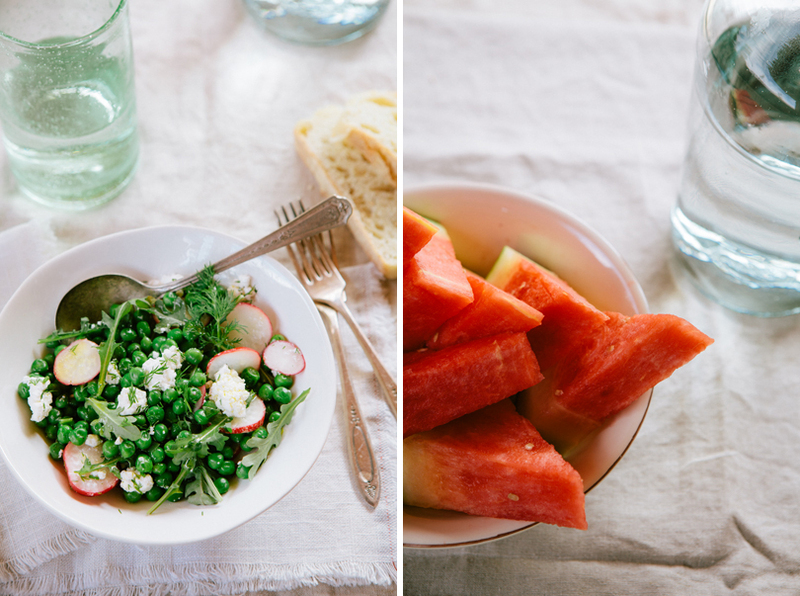 Use this vinaigrette to dress the salad. Serve immediately. 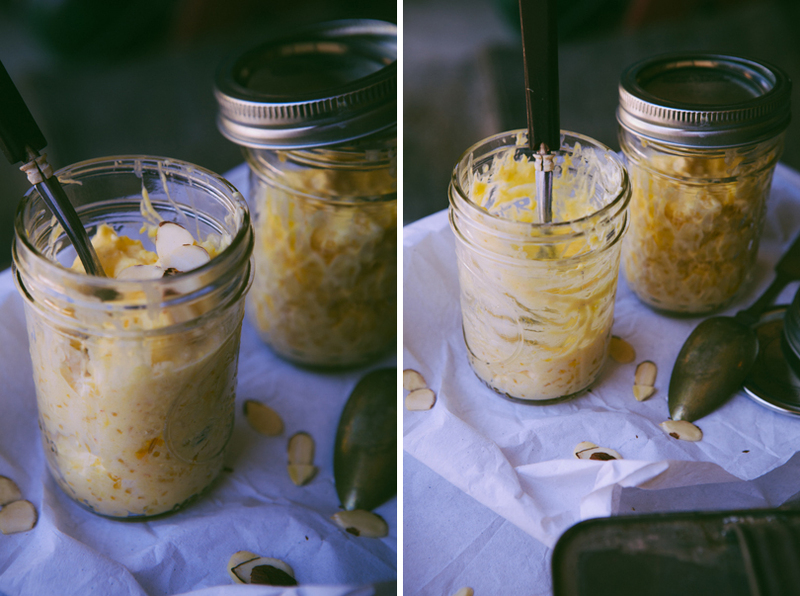 Short and sweet today: rice pudding. I like its texture: the rice is cooked to very soft consistency and then mixed with whipped cream. The result is airy, souffle-like dessert that is both cozy/simple and fancy enough to serve in nice individual serving bowls. 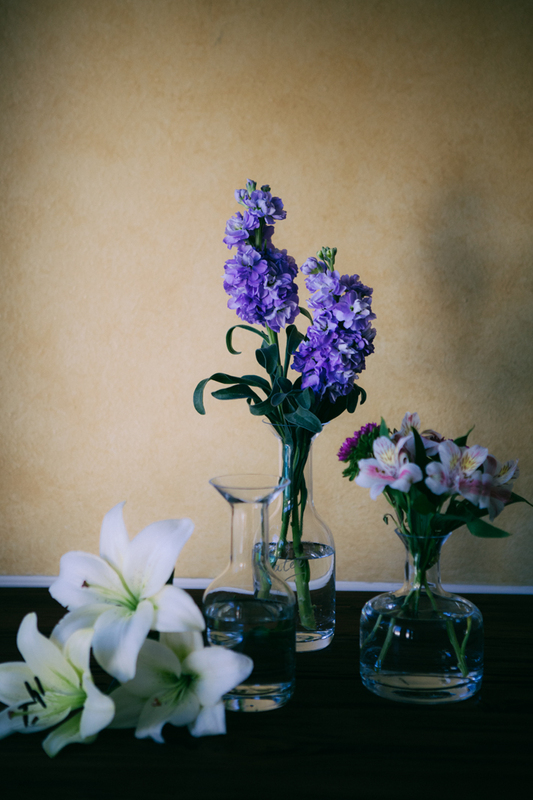 I make no secret of my love of cardamom and saffron: upside down plum cake, cinnamon and cardamom rolls, and panna cotta are all made using one or both of these spices. Great combination. Mix milk, 2 tablespoons sugar, salt and rice in heavy pot. Bring to boil, reduce heat and simmer 35-40 minutes, until thick and creamy. Add cardamom and saffron, remove from heat and cool completely. Whip cream with remaining 1 tablespoon sugar, carefully mix into the rice mixture. 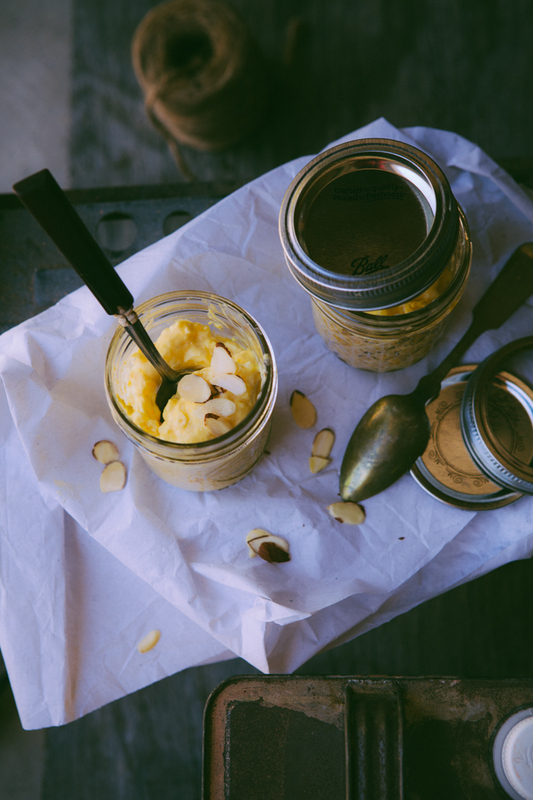 Serve with almonds if desired. 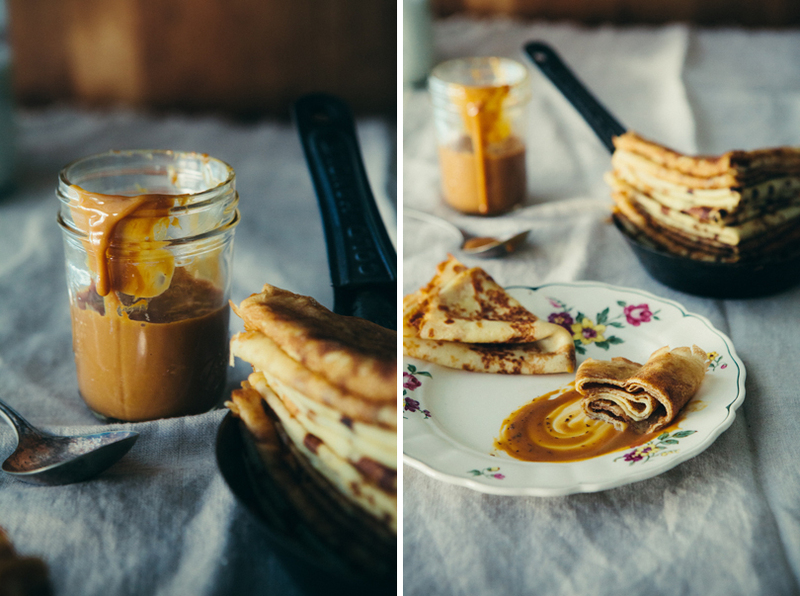 It's Maslenitsa week next week! We must prepare. Maslenitsa in the Russian Orthodox tradition is the week that precedes the 40 days of the Great Lent, when no meat, fish, dairy or eggs are allowed. 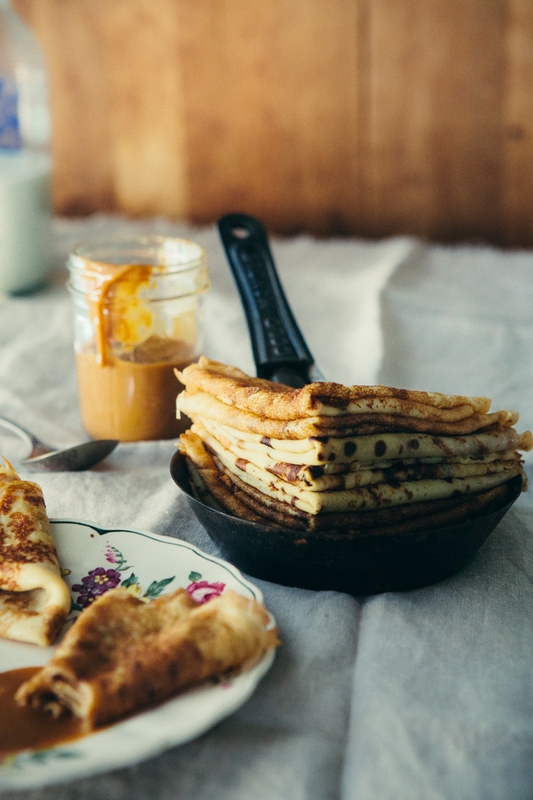 Therefore, Maslenitsa is the time when people traditionally make bliny - large, thin, crepe-like pancakes that are slathered with generous amounts of butter. 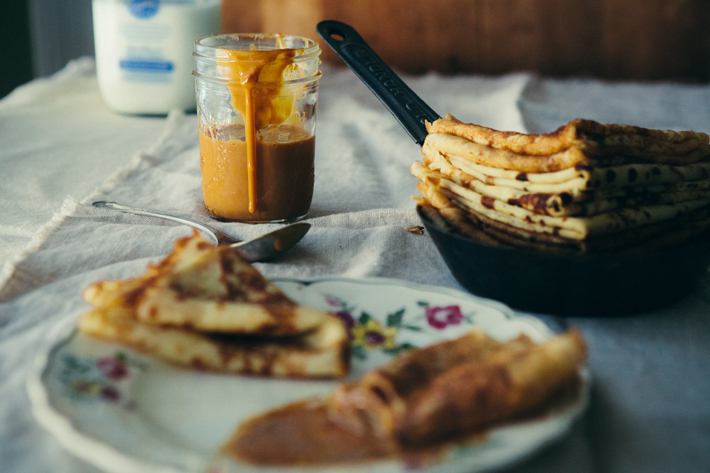 In fact, the word Maslenitsa comes from the word maslo, which means "butter." Maslenitsa falls on the end of winter, so it is also the time to celebrate the coming of spring. In the end of the Maslenitsa week a large doll representing winter is often burned on the town square, amidst celebration, to say goodbye to the cold days and to greet in the spring. Both the idea of feasts and the public celebration makes the festival similar to Mardi Gras. Bliny are traditionally served with jelly, sour cream, honey, plain or cooked condensed milk (the same as used in Banoffee Tartlets) and yes, caviar. The bliny (by the way, the singular form of bliny is blin) that I have seen in many US cookbooks - small, thick pancakes served with sour cream and caviar or salmon roe - are really olady, pancakes. Bliny are large and thin, which also makes them perfect for wrapping around savory fillings, such as meat or tvorog, farmer cheese (more about it here). This time I simply made toffee sauce by combining cooked and regular condensed milk. Bliny have a reputation of being hard to make. There is even a common expression in Russian, pervy blin vsegda komom - "the first blin always comes out in a lump," meaning do not get discouraged if your first effort is less than successful. But with modern non-stick skillets making bliny is not hard at all. All it takes is a little practice and patience. And if you quickly eat your first lumpy blin - who's to know it wasn't perfect! I prefer to use two skillets at the same time as it makes things go so much faster. I have also tried three skillets and nope... couldn't keep up :). Bliny can be made with yeast, baking soda or no leavening at all. For the liquid, milk, buttermilk (kefir - more about it here) or water can be used. I have even seen (and tried) recipes using carbonated water because the bubbles help create tiny holes in the bliny, making them lacy. I find that regular white flour works best, but it is also possible to substitute some of it with buckwheat or other types of flour. The recipe below is adapted from the one I got from my friend's mom. Over the years, I have experimented with dozens of recipes but now I think my search is over. These are perfect. They have a nice sweetness to them (in fact, I prefer to eat them with nothing at all, just enjoying their buttery goodness), but they are also not too sweet to be used with savory fillings. When growing up, we never used knives or forks when eating bliny. You just fold a blin into a nice triangle and dip the tip into your accompaniment of choice (even melted butter!). 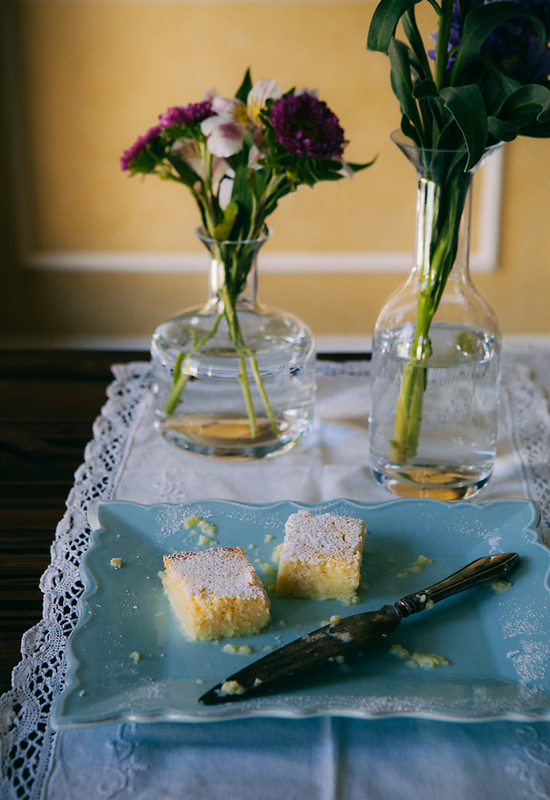 I still like to eat them this way: there is certain tactile pleasure in touching these soft, warm cakes before taking a bite. I hope you will go for it... and enjoy. Mix flour, sugar, salt, eggs, oil and 1 cup milk until smooth (immersion hand blender works great). Mix in the rest of the milk and the water. Cover and refrigerate the batter for 15 minutes. On medium high, heat a nonstick skillet. Run the stick of butter around the bottom of the skillet to grease. It only needs to be done once. Using a ladle, pour a few tablespoons of batter onto the center of the pan. Swirl the pan so that the batter coats the bottom of the pan evenly. You will get a feel of the right amount of batter to use after a few tries. 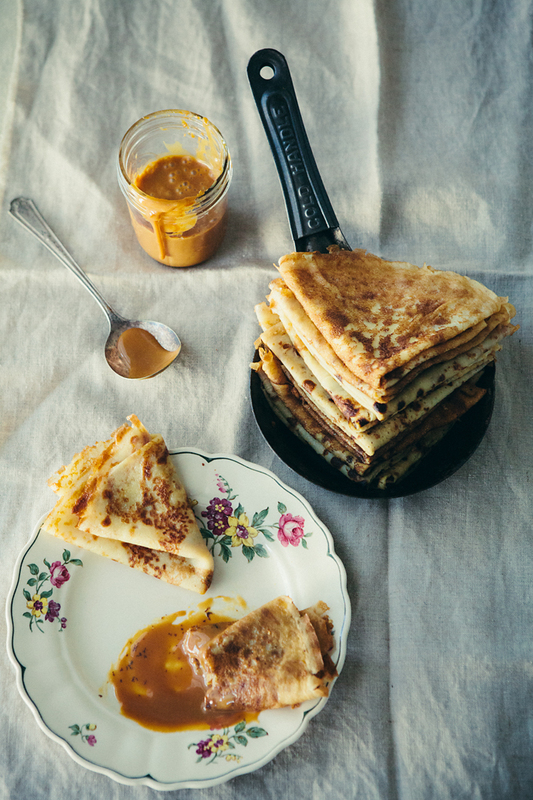 Once the edges of the crepe begin to brown, run a spatula around the sides to loosen. Use your fingers to flip the crepe over. Cook a few seconds more then invert onto a plate. Generously grease the crepe with a stick of butter before stacking the next one on top.